Snippets of Jack: "The lies I told you were not lies." "The lies I told you were not lies." Remember how sometimes we call Elizabeth Swann Lizzie? Or Philip Swift, P. Swift? Well I just came up with a really good nickname for Angelica: Angie! Now, I know that it's not exactly a new name and I didn't just make it up, but I've been wondering why I haven't tried calling her that before. So, this post will be all about Angie. She's apparently the daughter of the infamous pirate, Blackbeard, but there seems to be some speculation about this. She tells Jack who her father is but does so in a sneaky way, making it seem like it's not really true: just a hoax to get what she wants. Blackbeard just gets super angry so Jack backs off. Jack has no idea about her father when he first meets her, in fact that was probably the last person he thought her father could be. Originally Jack meets her in a convent. Just don't even ask why he was there: it'll break your heart. However, she was there because she was preparing to become a nun. Think of that: the daughter of one of the most infamous pirates ever known becoming a nun. Yeah, she must have had the same thought and got cold feet. Of course, Jack influenced her decision a bit when she fell in love with him. But we all know that Jack doesn't get tied down away from the sea easily and certainly not for every long. So he leaves her in the end to do what he loves, resulting in some rather bitter feelings of hers towards him. She seems to get even on this when she pretends to be him, shoots him with a sleeping dart, drags in unconscious body onto her supposed daddy's ship, lies to him (kinda) about her family tree, and then forces him into labor. We all know that Jack prefers to be in charge, not take orders from zombie quartermasters and female first mates. First he threatens her to come to her senses and tell him what's really going on. That's when she tells him about Blackbeard being her "father" and how they can sail to the Fountain of Youth together still. Jack's still not a big fan of all this so he talks to Blackbeard himself about it first. When things don't really go over well with the captain, he returns to the first mate, this time using seduction to get what he wants. But then he realizes that while the Fountain of Youth gives life to some people, it takes away the deaths of others: one must live while the other dies. Clearly, he and Angelica can't go there together, bathe themselves in riches and eternal life and live happily ever after together because one of them would have to die. Not to mention Angie is still caught up in her mission to save her father from the foreseen murder at the hands of a one-legged man. She plans on instead using the one-legged man as the life to be lost at the Fountain to save her father. Jack seems to be on board with this plan, except that since he's Jack he also has about fifty other alternative motives and alliances to get what he wants. He also sprouts up this plan with Barbossa, the one-legged man, to get him to the Fountain also, setting the stage for this epic match. In the end, Angelica is the one who gets to drink from the magical waters because Jack tricked her into it and no one else can because the Spanish completely destroyed the place. All that for nothing, but at least they disposed of Blackbeard. Of course, that's not so great for Angie since that seemed to be the whole reason she set sail for the Fountain in the first place. She was also hoping to convert him along the way, which didn't really happen either. Things only really go downhill for her when Jack somehow transports the two of them in a little long boat to some speck of land in the middle of no where (surrounded by very beautiful and peaceful water though. )This time she tries to seduce him into doing what she wants, resulting to perhaps more lies and even violence (pulls out a pistol). 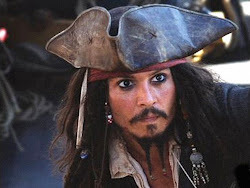 But keeping with the theme of the day, it doesn't work for her and Jack just leaves to keep on with his pirating life. Yo ho yo ho! Things take an interesting turn though when she finds his voodoo doll. Wonder what she will do with it? Hopefully the next movie will tell us!